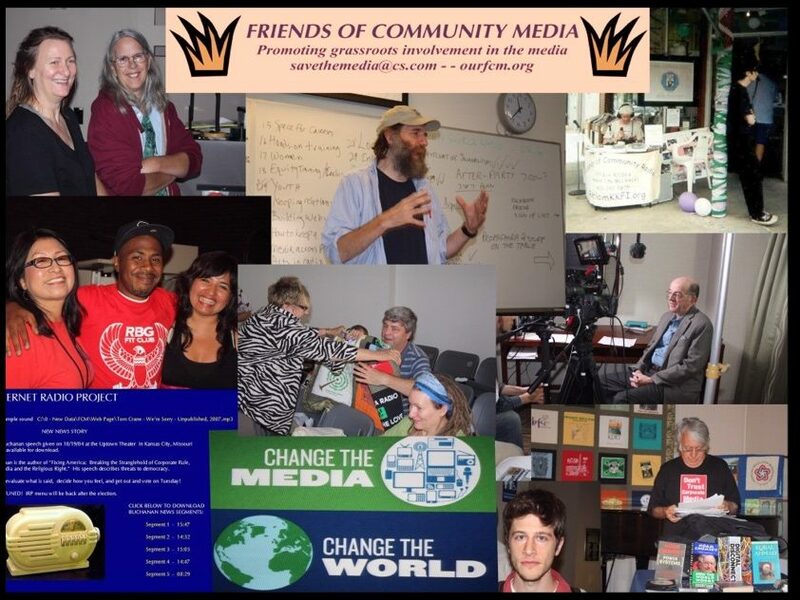 Friends of Community Media (FCM) is a 501(C)3 not-for-profit organization set up to preserve and foster citizen participation in the media. FCM wants local media to focus more on local news, music, literary arts, history, and ideas. FCM also assists diverse groups and citizens to create their own media, influence existing media, & promote diverse media ownership. Based in Kansas City, Missouri, FCM works to help preserve existing community media, make existing media responsive to the public, be a media watchdog, publish new forms of citizen-based media, create public service programming, train citizens in media literacy, and encourage media outlets to meet moral and legal civic obligations. FCM has sponsored, the Grassroots Radio Conference, Progressive Media Awards, supported with a week of media awareness activities called Media4Us, conducted Communiversity classes, supported local community media and participated in media awareness activities. Those interested in FCM efforts may contact us at Friends of Community Media at savethemedia@cs.com. Free expression: People should be able to speak their minds to whoever will listen.